Newcastle Containers are able to provide a wide range of container options and accessories. Our range help you get the most out of your container, transforming it from a metal box into a usable work or living space. Below we list some of the items we are able to offer with your container, please note this is not an exhaustive list and we would love you to contact us on 0333 600 6260 to discuss your requirements. 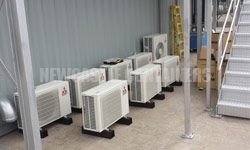 For those of you that require climate control in your container, we can provide a wide range of air conditioning, air handling and ventilation options. You may be storing products or equipment that require a certain temperature, or you may be working out of your container and require air conditioning during those summer months. Container awnings are particularly useful if your container is being used as a bar, shop, restaurant, dwelling, or office. Our awnings create shaded areas in front of your container and look visually appealing. Container canopies create a sheltered / shaded space between two standard 20ft or 40ft shipping containers. Canopies are portable, multi- purpose, easy to install and quick to dismantle. Attaching to two standard 20ft or 40ft shipping containers, container canopies will maximise storage space without breaking the bank. Sometimes the industrial look of a container just does not fit into the environmental surroundings, no matter what colour the container is. We have solved this issue with the help of timber cladding. With a self-supporting timber baton frame we can ensure that the container walls won’t be perforated in the process, in order to uphold the wind and water tight nature of the container. We can offer a wide range of condensation control options for your container including Grafo-Therm to help prevent the dripping of condensation, lining, moisture traps and moisture absorption poles. A CSC Plate or CSC Verification can be described as a shipping containers‘passport’. It is a small metal plate fixed to the doors of the container to confirm to shipping lines that the container is structurally sound and safe to ship cargo by vessel around the world. Our shipping container personnel doors are ideal if you regularly use your container, and require easy access. We will work with you to decide where best to place the doors, and can provide a completely bespoke solution. We offer a range of different flooring options to suit every container conversion, whether it be carpet in a container home or recording studio, vinyl in your new canteen or drying room or underfloor heating flooring with stylish specialist tiling for a new art gallery. If you are using your container for personal use, as a workshop or simply using your container regularly, you may need heating within your container. For best results you need to line your container first, but we will of course work to your specification. We are able to supply any number of 2KW wall mounted convector heaters inside your container along with a RCD consumer unit. You may want to line your container for aesthetic reasons (e.g in an office or canteen), to control temperature swings or condensation inside your container, whatever your reasons for lining your container we are able to provide insulated ply lining with a melamine or ply finish if required. We are able to supply magnetic LED lighting strips in our budget range that are battery operated and fix to the inside of the container walls for short term use or occasional use. We offer an extensive range of products and services in order to meet with your container requirements. Whether this be repainting a container, applying specialised products such as reflective paint, or simply providing a small pot of paint to touch up the container, we will do our very best to ensure the container is exactly how you want it. Our container ramps are convenient for loading heavier items in and out of your container as well as having many health and safety benefits. We are able to supply our container ramps in both heavy duty and budget ranges dependent on your requirements. Roller shutter doors can be added to the end or side panel of a container to provide extra space, improved loading options and improved ease of loading/un-loading your container. Similarly, from a non-storage point of view roller shutters have a wide variety of uses, for example, a roller shutter with a ledge provides the perfect serving facility, portable bar, pop up retail establishment etc. We offer a variety of different security options to ensure your goods are safely stored. There are different types of heavy duty padlocks that we recommend and are able to supply. All of our products are tamper proof, corrosion resistant and criminal resistant. We offer an extensive range of shelving systems that are not only practical for offices, workshops factories and warehouses, but also shipping containers. They make loading and removal of goods from shelves extremely easy. When containers are stacked, and access is required on all levels, container staircases can be fabricated and installed to provide safe access. These staircases are used with multi-storey conversions such as offices, homes and exhibition stands. Available in a wide range of styles, sizes and colours, our staircases can be fabricated to meet your specific needs. Our tarpaulins come in sizes suitable for 20ft and 40ft open top containers. An open top container has standard cargo doors to one 8ft end and an open roof which can be covered with tarpaulin for safe transit of goods. The tilt is then supported by 19 roof bows. The rear header on the open top container can be removed or swung to allow easy entry of oversized cargo. You may require your containers to be stacked due to lack of space on site, if you are using accommodation units you may require a storage container on the base and an office on top with a set of stairs to access. Our twist locks hold the containers into place making them safe and sturdy for most applications. Our container windows are ideal if you regularly use your container, and require natural light. We will work with you to decide where best to place the windows, and can provide a completely bespoke solution. We are also able to supply and fit a number of bespoke fixed frame windows which look particularly striking in some of our high end conversion projects.